Adam Willaerts – The National Maritime Museum BHC0266. Title: Embarkation of the Elector Palatine in the ‘Prince Royal’ at Dover, 25 April 1613. Date: 1622. Materials: oil on panel. Dimensions: 77.4 x 137.1 cm. Nr. : BHC0266. 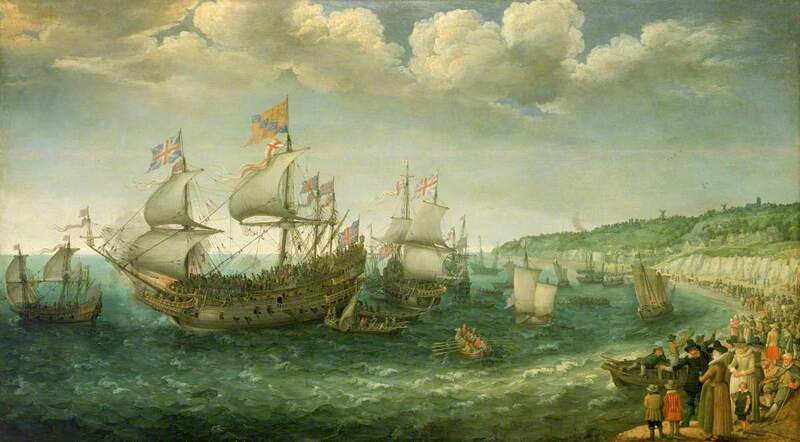 Source: https://artuk.org/discover/artworks/embarkation-of-the-elector-palatine-in-the-prince-royal-at-dover-25-april-1613-176135. I have changed the light and contrast of the original photo. Adam Willaerts – Rijksmuseum SK-A-1927. Title: Ships off a Rocky Coast. Date: 1621. Materials: oil on panel. Dimensions: 62.5 x 122.1 cm. Inscriptions: A. Willarts. f 1621 v (bottom centre). Nr. : SK-A-1927. Source: https://www.rijksmuseum.nl/en/search/objects?p=1&ps=12&f.principalMakers.name.sort=Adam+Willaerts&st=Objects&ii=4#/SK-A-1927,4g. I have changed the light and contrast of the original photo.